Developing scalable servers in Java now requires careful consideration of mechanical sympathetic issues to achieve both high throughput and low latency. With the introduction of HTTP/2 multiplexed semantics to Jetty, we have taken the opportunity to introduce a new execution strategy based on the eat what you kill hunting ethic, which is providing wins over the following: avoiding dispatch latency; running tasks with hot caches; reducing contention and parallel slowdown; reducing memory footprint and queue depth. The optimisation task that we trying to solve is how to handle potentially many producers, each producing many tasks to run, and how to run the tasks that they produce so that they are consumed in a timely and efficient manner. It has the advantage of simplicity, but suffers the fundamental flaw of head-of-line blocking (HOL): If one of the tasks blocks or executes slowly (e.g. task C3 above), then subsequent tasks will be held up. This is actually good for a HTTP/1 connection where responses must be produced in the order of request, but is unacceptable for HTTP/2 connections where responses must be able to return in arbitrary order and one slow request cannot hold up other fast ones. It is also unacceptable for the NIO selection use-case as one slow/busy/blocked connection must not prevent other connections from being produced/consumed. Tasks are produced by one thread and then consumed by another thread. This means that tasks are consumed on CPU cores with cold caches and that extra CPU time is required (indicated above in orange) while the cache loads the task related data. For example, when producing a HTTP request, the parser will identify the request method, URI and fields, which will be in the CPU’s cache. If the request is consumed by a different thread, then all the request data must be loaded into the new CPU cache. This is an aspect of Parallel Slowdown which Jetty has needed to avoid previously as it can cause a considerable impact on the server throughput. Slow consumers may cause an arbitrarily large queue of tasks to build up as the producers may just keep adding to the queue faster than tasks can be consumed. This means that no back pressure is given to the production of tasks and out of memory problems can result. Conversely, if the queue size is limited with a blocking queue, then HOL blocking problems can re-emerge as producers are prevented for queuing tasks that could be executed. Every task produced will experience a dispatch latency as it is passed to a new thread to be consumed. While extra latency does not necessarily reduce the throughput of the server, it can represent a reduction in the quality of service. The diagram above shows the total 5 tasks completing sooner than ProduceConsume, but if the server was busy then tasks may need to wait some time in the queue before being allocated a thread. Another aspect of parallel slowdown is the contention between related tasks which a single producer may produce. For example a single HTTP/2 connection is likely to produce requests for the same client session, accessing the same user data. If multiple requests from the same connection are executed in parallel on different CPU cores, then they may contend for the same application locks and data and therefore be less efficient. Another way to think about this is that if a 4 core machine is handling 8 connections that each produce 4 requests, then each core will handle 8 requests. If each core can handle 4 requests from each of 2 connections then there will be no contention between cores. However, if each core handles 1 requests from each of 8 connections, then the chances of contention will be high. It is far better for total throughput for a single connections load to not be spread over all the systems cores. Thus the ProduceExecuteConsume strategy has solved the HOL blocking concern but at the expense of very poor performance on both latency (dispatch times) and execution (cold caches), as well as introducing concerns of contention and back pressure. Many of these additional concerns involve the concept of Mechanical Sympathy, where the underlying mechanical design (i.e. CPU cores and caches) must be considered when designing scalable software. Pretty Bad! We have written a benchmark project that compares the Produce Consume and Produce Execute Consume strategies (both described above). The Test Connection used simulates a typical HTTP request handling load where the production of the task equates to parsing the request and created the request object and the consumption of the task equates to handling the request and generating a response. It can be seen that the ProduceConsume strategy achieves almost 8 times the throughput of the ProduceExecuteConsume strategy. However in doing so, the ProduceExecuteConsume strategy is using a lot less CPU (probably because it is idle during the dispatch delays). Yet even when the throughput is normalised to what might be achieved if 60% of the available CPU was used, then this strategy reduces throughput by 30%! This is most probably due to the processing inefficiencies of cold caches and contention between tasks in the ProduceExecuteConsume strategy. This clearly shows that to avoid HOL blocking, the ProduceExecuteConsume strategy is giving up significant throughput when you consider either achieved or theoretical measures. Consideration of the SEDA architecture led to the development of the Disruptor pattern, which self describes as a “High performance alternative to bounded queues for exchanging data between concurrent threads”. This pattern attacks the problem by replacing the queue between producer and consumer with a better data structure that can greatly improve the handing off of tasks between threads by considering the mechanical sympathetic concerns that affect the queue data structure itself. While replacing the queue with a better mechanism may well greatly improve performance, our analysis was that it in Jetty it was the parallel slowdown of sharing the task data between threads that dominated any issues with the queue mechanism itself. Furthermore, the problem domain of a full SEDA-like architecture, whilst similar to the Jetty use-cases is not similar enough to take advantage of some of the more advanced semantics available with the disruptor. Even with the most efficient queue replacement, the Jetty use-cases will suffer from some dispatch latency and parallel slow down from cold caches and contending related tasks. In a work stealing scheduler, each processor in a computer system has a queue of work items to perform…. New items are initially put on the queue of the processor executing the work item. When a processor runs out of work, it looks at the queues of other processors and “steals” their work items. This concept initially looked very promising as it appear that it would allow related tasks to stay on the same CPU core and avoid the parallel slowdown issues described above. It would require the single task queue to be broken up in to multiple queues, but there are suitable candidates for finer granularity queues available (e.g. the connection). Unfortunately, several efforts to implement it within Jetty failed to find an elegant solution because it is not generally possible to stick a queue or thread to a processor and the interaction of task queues vs thread pool queues added an additional level of complexity. More over, because the approach still involves queues it does not solve the back pressure issues and the execution of tasks in a queue may flush the cache between production and consumption. However consideration of the principles of Work Stealing inspired the creation of a new scheduling strategy that attempt to achieve the same result but without any queues. The Eat What You Kill strategy (prosaically named ExecuteProduceConsume for the production version) has been designed to get the best of both worlds of the strategies presented above. It is nick named after the hunting movement that says a hunter should only kill an animal they intend to eat. Applied to the producer consumer problem this policy says that a thread must only produce (kill) a task if it intends to consume (eat) it immediately. However, unlike the ProduceConsume strategy that adheres to this principle, ExecuteProduceConsume still performs dispatches, but only to recruit new threads (hunters) to produce and consume more tasks while the current thread is busy eating ! Serial queueless execution like this is optimal for a servers throughput: There is not queue of produced tasks wasting memory, as tasks are only produced when needed; tasks are always consumed with hot caches immediately after production. Ideally each core and/or thread in a server is serially executing related tasks in this pattern… unless of course one tasks takes too long to execute and we need to avoid HOL blocking. In this idle case there is a dispatch for every task, which is exactly the same dispatch cost of ProduceExecuteConsume. However this is only the worst case dispatch overhead for EatWhatYouKill and only happens on a mostly idle server, which has spare CPU. Even with the worst case dispatch case, EatWahtYouKill still has the advantage of always consuming with a hot cache. An alternate way to visualise this strategy is to consider it like ProduceConsume, but that it dispatches extra threads to work steal production and consumption. These work stealing threads will only manage to steal work if the server is has spare capacity and the consumption of a task is risking HOL blocking. A hot cache is always used to consume a produced task. Good back pressure is achieved by making production contingent on either another thread being available or prior consumption being completed. There will only ever be one outstanding dispatch to the thread pool per producer which reduces contention on the thread pool queue. Unlike ProduceExecuteConsume, which always incurs the cost of a dispatch for every task produced, ExecuteProduceConsume will only dispatch additional threads if the time to consume exceeds the time to dispatch. On systems where the dispatch delay is of the same order of magnitude as consuming a task (which is likely as the dispatch delay is often comprised of the wait for previous tasks to complete), then this strategy is self balancing and will find an optimal number of threads. While contention between related tasks can still occur, it will be less of a problem on busy servers because related task will tend to be consumed iteratively, unless one of them blocks or executes slowly. Indications from the benchmarks is that it is very good ! 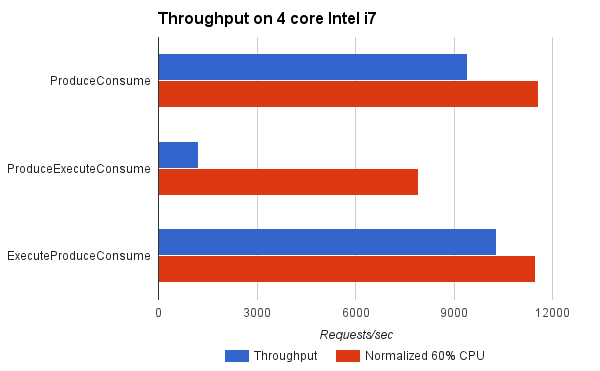 For the benchmark, ExecuteProduceConsume achieved better throughput than ProduceConsume because it was able to use more CPU cores when appropriate. 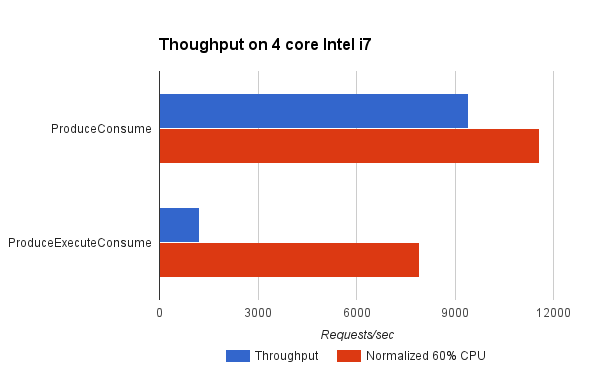 When normalised for CPU load, it achieved near identical results to ProduceConsume, which is to be expected since both consume tasks with hot caches and ExecuteProduceConsume only incurs in dispatch costs when they are productive. This indicates that you can kill your cake and eat it too! The same efficiency of ProduceConsume can be achieved with the same HOL blocking prevention of ProduceExecuteConsume. A selector thread T1 wakes up because it has detected IO activity. (T1) An ExecuteProduceConsume strategy processes the selected keys set. (T1) An EndPoint with input pending is produced from the selected keys set. Another thread T2 is dispatched to continue producing from the selected keys set. (T1) The EndPoint with input pending is consumed by running the HTTP/2 connection associated with it. (T1) An ExecuteProduceConsume strategy processes the I/O for the HTTP/2 connection. (T1) A HTTP/2 frame is produced by the HTTP/2 connection. Another thread T3 is dispatched to continue producing HTTP/2 frames from the HTTP/2 connection. (T1) The frame is consumed by possibly invoking the application to produce a response. (T1) The thread returns from the application and attempts to produce more frames from the HTTP/2 connection, if there is I/O left to process. (T1) The thread returns from HTTP/2 connection I/O processing and attempts to produce more EndPoints from the selected keys set, if there is any left. This allows a single thread with hot cache to handle a request from I/O selection, through frame parsing to response generation with no queues or dispatch delays. This offers maximum efficiency of handling while avoiding the unacceptable HOL blocking. Early indications are that Jetty-9.3 is indeed demonstrating a significant step forward in both low latency and high throughput. This site has been running on EWYK Jetty-9.3 for some months. We are confident that with this new execution strategy, Jetty will provide the most performant and scalable HTTP/2 implementation available in Java.